SCI-FI-LONDON 09 kicks off later this month. Unless you have been asleep under a dark monolith you will know that SCI-FI-LONDON is the UK’s leading genre event and an internationally recognised launch pad for genre movies. At each festival they have at least a dozen UK premieres, special screenings and other sci fi related events. This year looks like it's a scorcher! 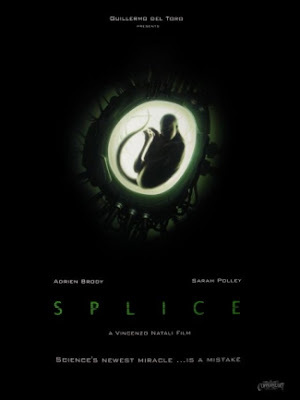 The opening night film for SCI-FI-LONDON 09 is non other than Vincenzo Natali's eagerly anticipated SPLICE. Uploaded by SFLTV. - Full seasons and entire episodes online. Directed by Vincenzo Natali and produced by Guillermo del Toro Splice is an exciting, and sometimes shocking, yet perfectly formed hybrid of horror and sci-fi with a difference.It’s common knowledge that genetically modified food is not a good thing, so splicing human and animal DNA together is a definite no-no. However, ambitious young scientists Clive (Adrian Brody) and Elsa (Sarah Polley) continue with their experiments, even after their funding is pulled. When they successfully produce a new hybrid species they become rebel superstars of the scientific world. Elsa decides to raise the creature as her own, and it goes through several changes that make normal hormonal changes of puberty pale into insignificance. Like all parents, Clive and Elsa think they have created the perfect offspring, until it makes its final, shocking metamorphosis that could destroy them, and those around them.